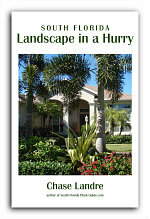 A Florida native, the pretty thatch palm likes the coastal and warmer areas of South Florida. 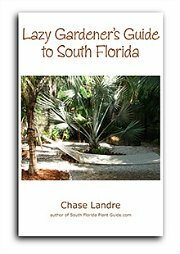 These palms are common along coastal highways in the southernmost areas of South Florida, but they can also make great landscape or container specimens. Solitary by nature, this palm is also grown in multiple trunk forms. It grows slowly and starts out life as more of a low-to-the-ground, palmetto-type plant - perfect for privacy screening. It eventually forms a thin trunk, which makes this palm a good fit for a tight space. The fall fruit produced on a mature specimen is a good food source for birds. This native palm is a very slow grower, with an ultimate height of about 15 to 20 feet, with weepy fan leaves and a narrow gray trunk. Sun or shade is fine for the thatch, and the more shade, the more slowly it grows. 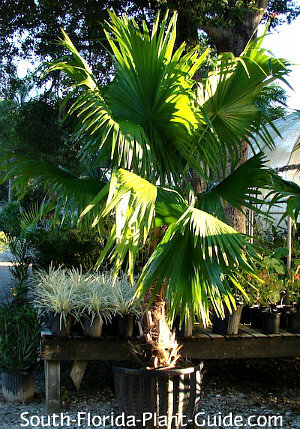 Tender and tropical, this palm is best in Zone 10B and along the southwest coast of Florida up to Naples. Because it's cold-sensitive in inland Zone 10 locations, minimize cold damage by placing it in an area sheltered from winter winds. Like many Florida native palms, this one is drought-tolerant once established, as well as being very salt-tolerant...another plus for beach-side locations. These palms don't really require soil amendments, though the addition of top soil to the hole certainly won't hurt. Do not plant in wet areas or places where the soil is thick...sandy soil is this palm's natural habitat. 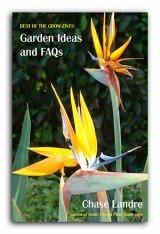 Fertilize 3 times a year - once in spring, summer and autumn - with a palm fertilizer containing micronutrients. Because it isn't self-cleaning, you'll have to prune off dead fronds yourself, but usually just a few times during the year. For cold protection for a young palm, especially in inland areas of Zone 10, you can tie up the fronds and wrap the head with frostcloth or warm blankets. 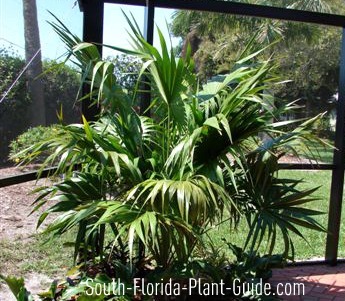 This palm works very well in small areas, and usually won't outgrow a pool cage planter if the interior is 15 feet or more. Single trunk palms can be planted 5 to 10 feet apart, and multi-trunk specimens may be placed close together to form a screening effect when the palms are young. You can also use them in narrow areas such as between buildings, where the head of the palm will eventually grow above the top of the buildings. Slow growth rate makes this an excellent container plant. 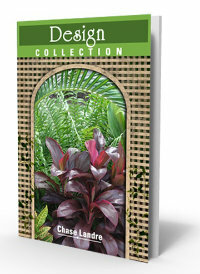 COMPANION PLANT SUGGESTIONS: Couple with other plants that like it on the dry side...like dwarf clusia, mid-size bougainvillea, crown of thorns, desert rose, and frangipani.